I am very doubtful that there will be another release of the 11.10. Until Shell can work without 3D acceleration I am not happy calling this a stable product. 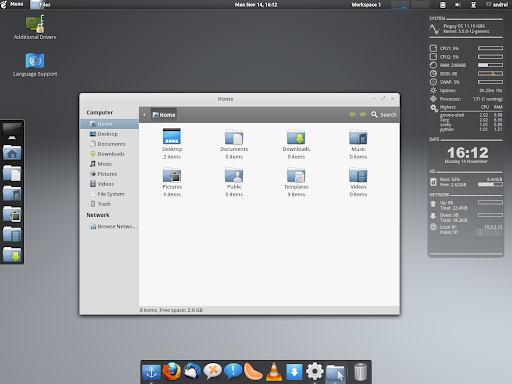 [...] I don’t feel Gnome 3.2 is mature enough to be called a stable product and thats why Pinguy OS 11.10 will stay as a beta release. For those not familiar with Pinguy OS: this is a Linux distribution based on Ubuntu that comes with many applications installed by default as well as a huge list of tweaks or fixes, making it a great Ubuntu alternative for those who want everything working out of the box. Window List (display a window list on the panel). The Weather and Window List extensions are disabled by default and can be enabled from GNOME Tweak Tool (which is installed by default). 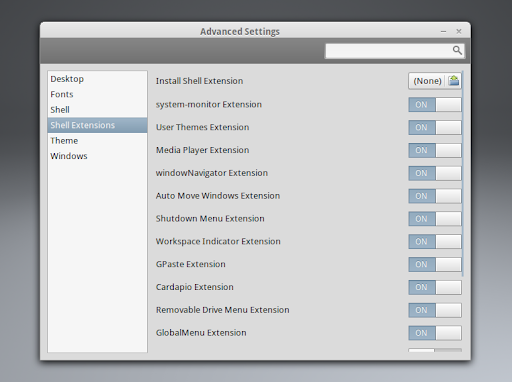 Most of these extensions have been added to provide an experience similar to what Pinguy OS users are used to, even though they are now using GNOME Shell instead of the GNOME 2.3x desktop. 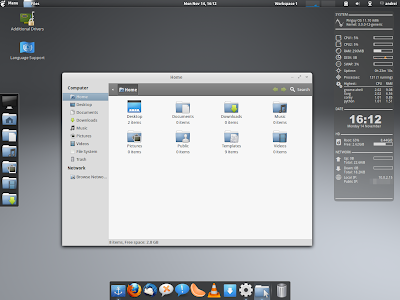 As for the artwork: Pinguy OS 11.10 uses Zukitwo GNOME Shell theme by default, Zukitwo Resonance as the GTK theme and elementary for the window theme. The icon theme is the same as in the previous Pinguy OS releases: elementary. For easily switching between windows, there's a Docky instance at the bottom and there's another Docky instance on the left which lets you easily access various folders. Also, most GNOME 3 applications (GNOME Contacts or GNOME Documents) are included by default in Pinguy OS 11.10, however, Pinguy OS uses Gloobus Preview instead of Sushi. 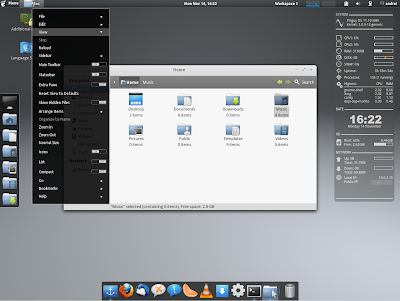 Further more, all GNOME Packages have been updated to version 3.2.1 - this includes Totem which is at version 3.0.x in Ubuntu 11.10. And as mentioned above, GNOME Tweak Tool has also been added to the default application selection. Oh, and our Y PPA Manager has also been added by default. Most of the other default applications are the same as in Pinguy 11.04: Firefox, Deluge, Dropbox, Empathy, Gwibber, Skype, TeamViewer, Thunderbird, XChat, LibreOffice, Shotwell, Rapid Photo Downloader, Pinta, Docky, Cover GLoobus, Nautilus, Shutter, Brasero, Calibre, wxBanker Finance Manager, Boot Repair, Gparted, Synaptic, Cheese, Arista Transcoder, HandBrake, VLC, XBMC, OpenShot Video Editor, gtkpod, DeVeDe, Clementine, Ailurus, Ubuntu Tweak, Wine and so on (but of course, they are updated to the latest version). 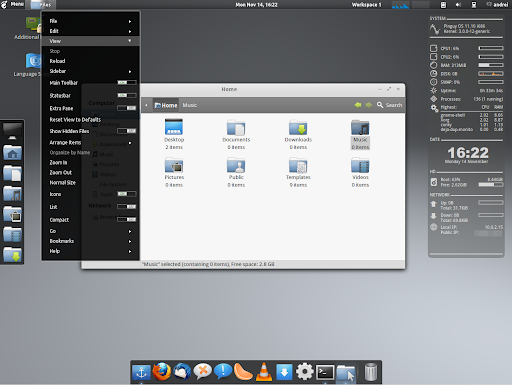 And finally, Pinguy OS continues to use GDM by default, despite the fact that Ubuntu has switched to LightDM. Even though Pinguy OS 11.10 (along with Linux Mint 12) provides one of the best out of the box GNOME Shell experiences, there are a few things that could have been better: the Activities Overview button shouldn't have been removed in my opinion. You can still use the Activities though, by pressing the Super/Win key. Also, providing an usable classic (fall-back session) would have been nice too. Right now, the indicators don't show up in the Pinguy OS 11.10 classic session top panel and this could have easily been fixed by using the patched Indicator Applet we wrote about a while back. This is of course only for those that can't run GNOME Shell so it doesn't affect the majority of users. 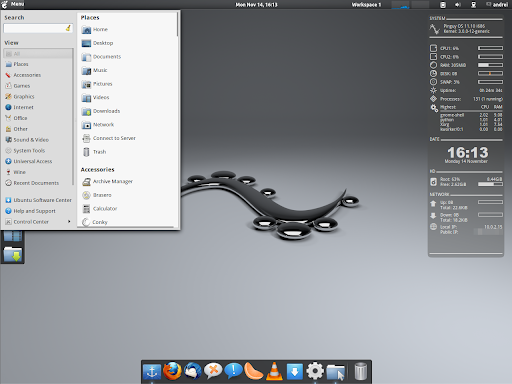 Other than that, Pinguy OS 11.10 is great for both those who want to use it because it comes with cool GNOME Shell tweaks as well as those who simply want everything working out of the box and don't care about the desktop environment used by default. This won't be the only Pinguy OS 11.10 release! An edition running MATE as default should be available too, but according to Pinguy it's going to take a while before it's released.